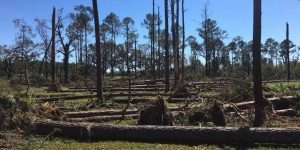 One of the unexpected consequences of all of the trees blown down by Hurricane Michael last year in the Florida Panhandle was that flooding of creeks has increased. The downed tress are acting as dams in creeks they cross, slowing the water and backing it up into areas that are not usually flooded. Removing the trees is a slow and ponderous process, so residents along the affected creeks could continue to see impacts from flooding in the coming months (and maybe years). You can read more and see photos in the Panama City News-Herald here.